Okay, so we’re going to admit something: year after year, Superbowl parties are always the same. There’s chips, dip, occasionally hot wings, there’s beer, there is a bet, and there’s a bunch of people anxiously glued to the television screen watching the most watched television event of the year. NEWSFLASH: your Superbowl party does not have to be a boring chip-and-dip situation. Not to hate on chips and dip of course, but we are also positive that with a little creativity, you are capable of throwing Superbowl parties that reinvent the wheel. We’re thinking less about the big game, more about the party. Check out these ideas on how to throw a game-day party people will remember for a lot longer than the score at the end of the game! You might have the skills to pull off an amazing event, but take the pressure off yourself and hire an event planner to make the magic happen. 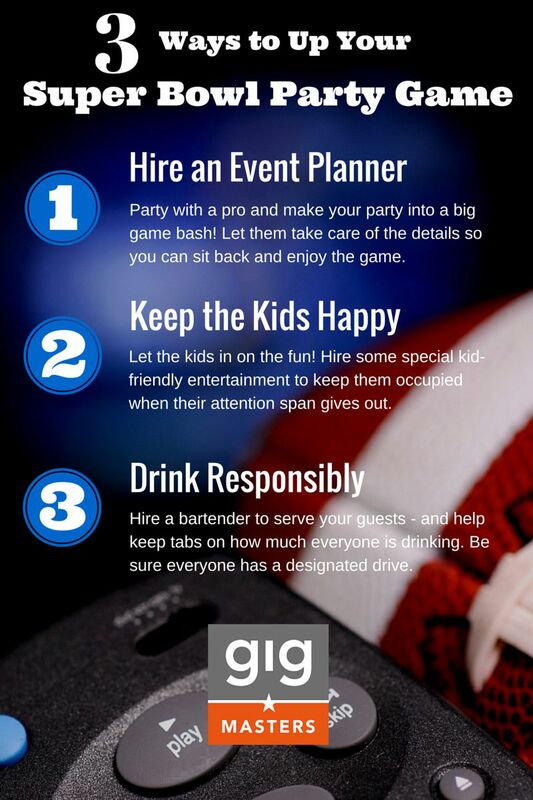 See some of the real Super Bowl Parties we love to see what a pro can bring to your game-day party. Then search GigMasters to find an event planner in your price range (they’re not ALL expensive) who will bring your party vibe up a notch! Even though the game is a little late, kids can still get in on the football fun. We love this list of ideas for keeping them occupied while the grown-ups get into the game. From balloon animals to games to facepainting, you can keep the kids smiling (and not standing directly in front of the TV). Yes, a good old American beer is a great combination with those mozzarella sticks you’re about to inhale, but if you’re looking up your game for the game, hire a cocktail bartender from Gigmasters to bartend your Superbowl party for a sophisticated touch on an old routine. But as always, be safe, and make sure at least one person at the party is NOT ordering those delicious Seahawk Blue Mojitos (custom created by your bartender, of course). Got pics from your big game party? Show them to us on our Facebook Page come Sunday.